Ce document au format PDF 1.4 a été généré par Acrobat: pictwpstops filter 1.0 / Acrobat Distiller 7.0.5 for Macintosh, et a été envoyé sur fichier-pdf.fr le 10/06/2013 à 18:25, depuis l'adresse IP 41.217.x.x. La présente page de téléchargement du fichier a été vue 821 fois. Taille du document: 302 Ko (6 pages). meaning of any text in terms of Wikipedia-based concepts. 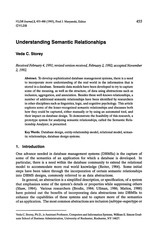 computing the degree of semantic relatedness between fragments of natural language text. vectors using conventional metrics (e.g., cosine). model is easy to explain to human users. [Buchanan and Feigenbaum, 1982; Lenat and Guha, 1990]. and Hirst, 2006; Jarmasz, 2003]. depth steadily increase over time. 2005] found Wikipedia accuracy to rival that of Britannica. http://store.britannica.com (visited on May 12, 2006). as weighted vectors of concepts, called interpretation vectors. “latent concepts” used by Latent Semantic Analysis. a single issue, which it discusses in detail. strength of association between words and concepts. those concepts whose weights for a given word are too low. vectors using the cosine metric. Figure 1 illustrates the process of Wikipedia-based semantic interpretation. Further implementation details are available in [Gabrilovich, In preparation]. Table 1: First ten concepts in sample interpretation vectors. representation with the one based on concepts. complicating White House efforts to build support for an attack on Saddam’s Iraqi regime. Table 2: First ten concepts of the interpretation vectors for sample text fragments. Table 3: First ten concepts of the interpretation vectors for texts with ambiguous words. hierarchy of over 400,000 concepts and 2,800,000 URLs. Using world knowledge requires additional computation. the semantic interpreter is several hundred words per second. standard” against which computer algorithms are evaluated. Jarmasz, 2003; Finkelstein et al., 2002], r = 0.88 − 0.95. These ﬁndings are to be expected—after all, it is this consensus that allows people to understand each other. the ODP deﬁnes the generalization relation between concepts and obviously violates this orthogonality requirement. judges were instructed to consider them as “similar” rather than “dissimilar”. techniques attempt to circumvent this limitation. words but little world knowledge in general. way. Second, considering words in context allows our approach to perform word sense disambiguation (see Table 3). yielding weighted multi-faceted representation of the text. models are notoriously difﬁcult to interpret, since the computed concepts cannot be readily mapped into natural concepts manipulated by humans. The Explicit Semantic Analysis method we proposed circumvents this problem, as it represents meanings of text fragments using natural concepts deﬁned by humans. of them is focused on a single topic. rather than the more narrowly deﬁned measures of similarity. it has been used in the literature. due to its use of a richer set if relations. text fragments of arbitrary length. 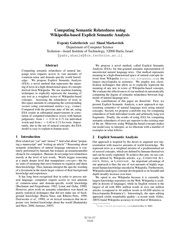 Wikipedia concepts, and semantic relatedness is then computed by comparing the two concept vectors. word appears within the text of Wikipedia articles. compare texts of any length. representation of ESA yields much better results. low scores of 0.31–0.54 on these domains. and provide a cornucopia of information about each concept. uses concepts explicitly deﬁned and described by humans. ESA model is easy to explain to human users. Wesley, New York, NY, 1999. [Banerjee and Pedersen, 2003] Satanjeev Banerjee and Ted Pedersen. Extended gloss overlaps as a measure of semantic relatedness. 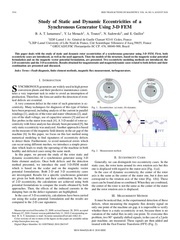 In IJCAI, pages 805–810, 2003. [Buchanan and Feigenbaum, 1982] B. G. Buchanan and E. A.
Knowledge-Based Systems in Artiﬁcial Intelligence. McGrawHill, 1982.
relatedness. Computational Linguistics, 32(1):13–47, 2006. [Dagan et al., 1999] Ido Dagan, Lillian Lee, and Fernando C. N.
Pereira. Similarity-based models of word cooccurrence probabilities. Machine Learning, 34(1–3):43–69, 1999. T. Landauer, and R. Harshman. Indexing by latent semantic analysis. JASIS, 41(6):391–407, 1990. [Fellbaum, 1998] Christiane Fellbaum, editor. WordNet: An Electronic Lexical Database. MIT Press, Cambridge, MA, 1998. Yossi Matias, Ehud Rivlin, Zach Solan, Gadi Wolfman, and Eytan Ruppin. Placing search in context: The concept revisited. ACM TOIS, 20(1):116–131, January 2002.
using world knowledge. 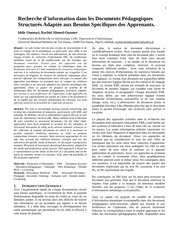 In IJCAI’05, pages 1048–1053, 2005.
knowledge. 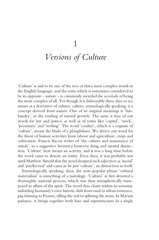 In AAAI’06, pages 1301–1306, July 2006. [Gabrilovich, In preparation] Evgeniy Gabrilovich. Feature Generation for Textual Information Retrieval Using World Knowledge. Institute of Technology, Haifa, Israel, In preparation. [Giles, 2005] Jim Giles. Internet encyclopaedias go head to head. unexplored contexts for semantic extraction from syntactic analysis. In ACL’92, pages 324–326, 1992.
experimental results. In PKDD’00, September 2000. [Jarmasz, 2003] Mario Jarmasz. Roget’s thesaurus as a lexical resource for natural language processing. Master’s thesis, University of Ottawa, 2003. [Jiang and Conrath, 1997] Jay J. Jiang and David W. Conrath. Semantic similarity based on corpus statistics and lexical taxonomy. Matthew Welsh. An empirical evaluation of models of text document similarity. In CogSci2005, pages 1254–1259, 2005. Proceedings of the 37th Annual Meeting of the ACL, 1999. Knowledge Based Systems. Addison Wesley, 1990.
word similarity. In ICML’98, 1998.
text semantic similarity. In AAAI’06, July 2006. [Miller and Charles, 1991] George A. Miller and Walter G.
and Cognitive Processes, 6(1):1–28, 1991.
ambiguity in natural language. JAIR, 11:95–130, 1999.
and Phrases. Longman Group Ltd., 1852. John B. Goodenough. Contextual correlates of synonymy. Communications of the ACM, 8(10):627–633, 1965.
of short text snippets. In WWW’06. ACM Press, May 2006. [Salton and McGill, 1983] G. Salton and M.J. McGill. An Introduction to Modern Information Retrieval. McGraw-Hill, 1983. [Sebastiani, 2002] Fabrizio Sebastiani. Machine learning in automated text categorization. ACM Comp. Surv., 34(1):1–47, 2002. Wikipedia. In AAAI’06, Boston, MA, 2006. [Zobel and Moffat, 1998] Justin Zobel and Alistair Moffat. Exploring the similarity space. ACM SIGIR Forum, 32(1):18–34, 1998. Ce fichier a été mis en ligne par un utilisateur du site. Identifiant unique du document: 00178460.